Can you believe how fast 2014 went by? Wowzers..I guess I've been busy because this year went super fast for me. I hope you all had a wonderful holiday and some vacation. It was nice to spend time with family and create more memories together here at my household. So I hope you are ready for this new year. I have decided to teach again!!! I'm so excited to have friends over my place again and play. Stampin'Up is ready too. 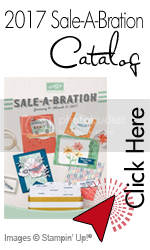 Today is the launch of the new Occasions mini catalog as well as the big event "Sale-A-Bration". For those of you who are old timers with this event, get ready to earn some awesome exclusive products for free. For those of you who are new to this event....well, read on and find out what all the excitement is all about. 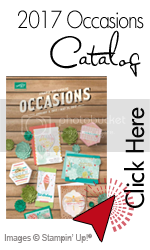 The occasions mini is finally out with brand new exclusive Stampin'Up stamps and products. Description: Spend 2 1/2 hours making a total of 10 cards for all those upcoming birthdays. These cards are great for anyone, whether they're for a friend, male/female, kids, etc... Techniques learned in this class will be direct-to-paper stamping, heat embossing and watercoloring and it's open to all levels (beginner through advanced). and here's another version of the above card...'cause who says we only need one version? Payment due on January 12 (no exceptions!). So why do I need advanced payment? Because I cut all papers and cardstock to size for each person. I'm telling you right now that the envelope punch board is a must have tool and I used it tons for making my holiday cards. The Typeset specialty paper is by far my most favorite paper Stampin'Up has ever had...it's lighter than their regular paper and it is amazingly versatile. I hope I get so see some of you local friends at the Birthday Bash class. 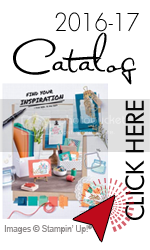 Please feel free to contact me with any questions and/or if you would like to host a workshop and earn some free Stampin'Up goodies. Wishing you all a very good start to the year!! !